Next Saturday the 26th of September there will be performances, poetry, talks and music about the 43 students missing of Ayotzinapa in Amsterdam . ( Plus 20,000 missing more ) The venue is the gorgeous garden of Tolhuiistin. All the funds collected are aiming to invite mexican journalists, academics and artist in November this year They will speak at the first edition of The Mexican Connection about structural solutions to Mexico’s current tough challenges. 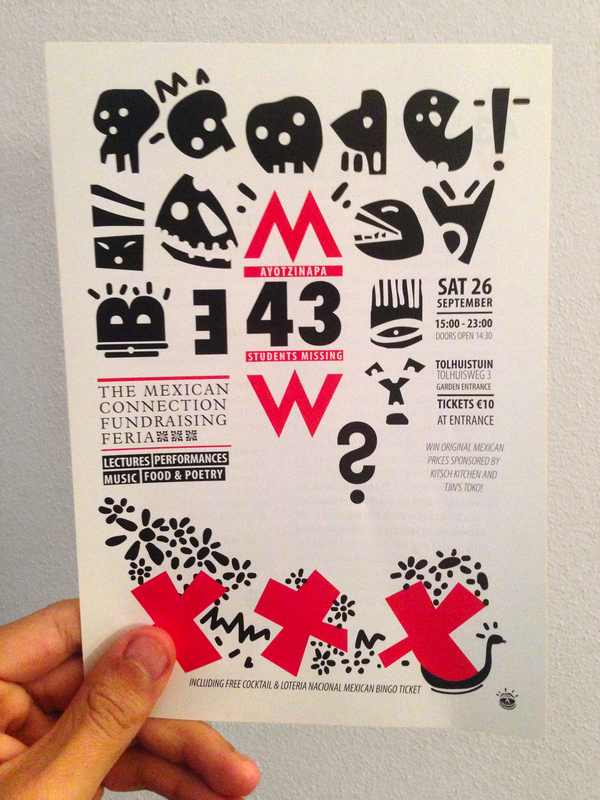 Of course this great event looks to create awareness about the critical situation that is living my Mexico . With all my shame and sadness, between the government, the narco – and something else – , are harassing, persecuting and killing my friends. “¿ A dónde van los desaparecidos? ¿Porque crees que se desaparecen ? –Por qué no todos somos iguales. ¿Cuándo vuelve el desaparecido ? ¿Cómo se llama el desaparecido? Thanks Erika Sprey, Insha Klinkenberg and Club Interbellum for inviting me to design the poster for this fabolous initiative. Previous PostPrevious El medio soy yo.